VFW 4464 member Keith Sheets stands watch over the ceremonial POW and MIA Empty Chair and Table during a windy Friday morning. The assembled prepare to listen to Grace Sydnor before she leads them in the National Anthem. 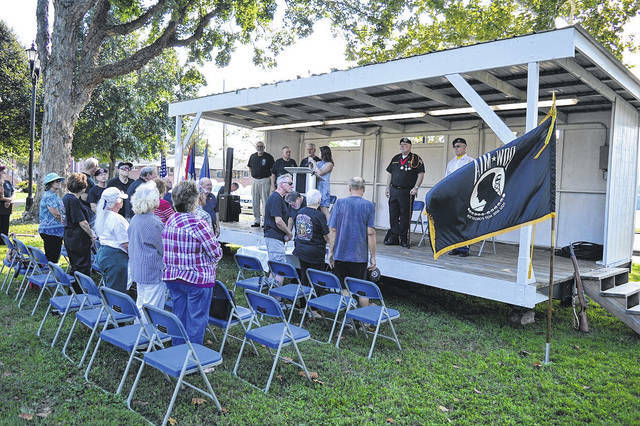 GALLIPOLIS — Gallia County remembered its lost and missing heroes Friday morning in remembrance of National POW and MIA Recognition Day by gathering in Gallipolis City Park to listen to Ron Wroblewski speak on unity in America. The event was presented by Gallia Vietnam Veterans of America Chapter 709 and Post 4464 of the Gallia Veterans of Foreign Wars. The ceremony was introduced by Jim Cozza. The invocation was given by VVA Chaplain John Jackson. Presentation of the Colors was given by VFW Post 4464 Honor Guard. Grace Sydnor of Gallia Academy High School led the National Anthem and patriotic music for the day. Cozza next described the significance of the POW MIA Empty Chair Ceremony. The table symbolizes the frailty of an isolated prisoner. The tablecloth is white and symbolic of the purity of the individual’s intentions to respond to their country’s call to arms. A single rose in a vase signifies the blood shed in sacrifice for country. The ribbon on vase represents the ribbons worn on lapels of the thousands who demand a proper accounting of comrades not among the public. The slice of lemon on a plate reminds others of the bitter fate of the missing. The salt on the plate reminds others of the tears shed as families wait for their loved ones return. The inverted glass is to remind others of those who cannot toast with their family and friends at the current time. The candles remind others of the light of hope that a soldier will return home. The American Flag reminds others that many may never return and reminds others of the pain and sacrifice to ensure freedom. Flags of the various military branches stand for those who served in their respective branches. The empty chair serves as the largest reminder of those who are still missing. Fred Mooney, of Northup, was killed in action February 27, 1971 as an Army Sergeant 1st Class in the country of Laos. 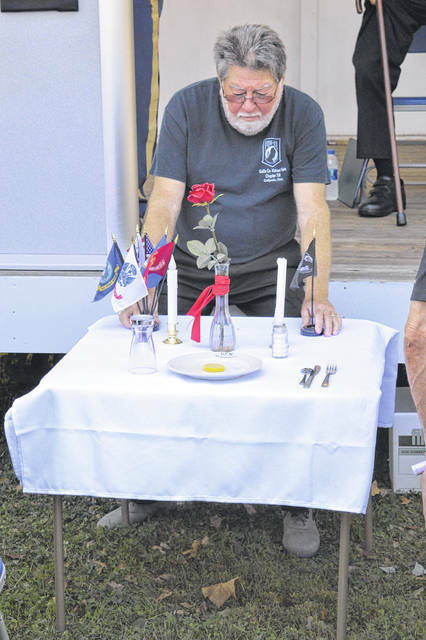 Veterans and residents of Gallia remembered him Friday. Wroblewski was born in Charleston, W.Va, graduated from Gallia Academy High School and is a Vietnam combat veteran having served as a field radio operator with the United States Marine Corps from mid 1963 to late 1966 (Vietnam 1965-1966). He served as the day’s keynote speaker. He says his service connected disability hasn’t diminished his love for America or his desire to continue to give back to his country. He is currently serving as the President of Tri-State Chapter 949, Vietnam Veterans of America and the West Virginia Marine Corps Coordinating Council. Wroblewski noted that U.S. President Donald Trump was in the process of getting American soldier remains returned from the Korean War. He noted it may take many years to get them identified though. Wroblewski said Americans were found in a prosperous land rooted in free enterprise and the Constitution that recognized the “God-given right” of the pursuit of happiness. Americans are generous and had assisted many countries struggling throughout history, he said. Robert Dunlap offered the closing prayer and VFW 4464’s Honor Guard held a closing rifle salute.